The atlas and its manual can be freely downloaded and can be interactively explored with MRIcro. Pigeons are classic animal models for learning, memory, and cognition. The majority of the current understanding about avian neurobiology outside of the domain of the song system has been established using pigeons. Since MRI represents an increasingly relevant tool for comparative neuroscience, a 3-dimensional MRI-based atlas of the pigeon brain becomes essential. Using multiple imaging protocols, we delineated diverse ascending sensory and descending motor systems as well as the hippocampal formation. This pigeon brain atlas can easily be used to determine the stereotactic location of identified neural structures at any angle of the head. In addition, the atlas is useful to find the optimal angle of sectioning for slice experiments, stereotactic injections and electrophysiological recordings. 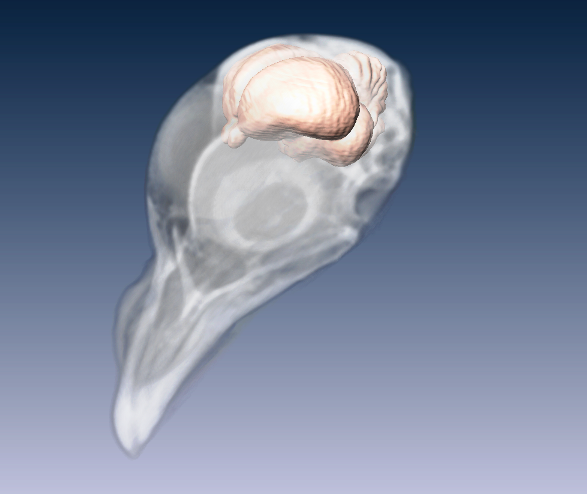 This pigeon brain atlas is freely available for the scientific community.